Just downstream from the Pont Neuf is the Pont des Arts, a seven span steel open spandrel deck arch supported on stone piers and abutments. It was built in 1984 and modeled after the previous bridge at this site. The bridge spans between the Louvre and the Academy of Fine Arts (within the Institut de France) which is how it derived its name. Moreover, it is used as an open air studio by painters and other artists. It is a very light and airy structure. The bridge deck is made of wooden planks, the barrier rails are an open wire mesh, and the bridge only carries pedestrian traffic. 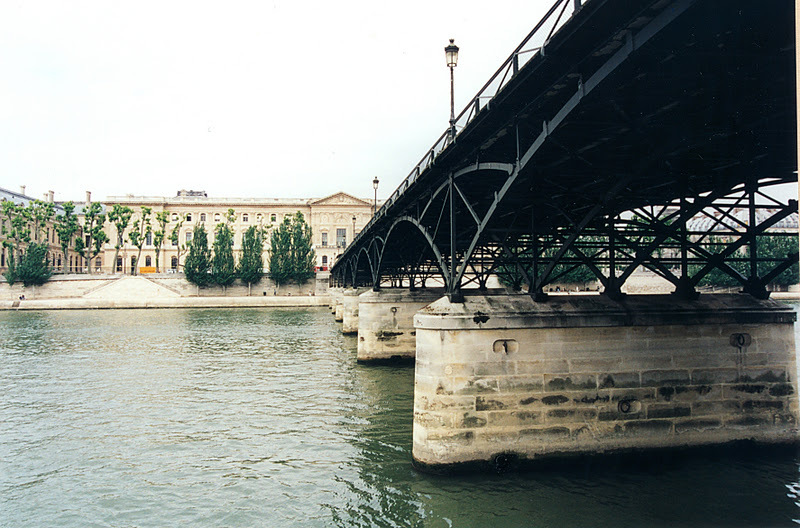 Seine River Bridges: Pont des Arts by Mark Yashinsky is licensed under a Creative Commons Attribution-NonCommercial-ShareAlike 3.0 United States License.